2018 Banff SoTL Symposium – Now accepting proposals! It’s spring… and time to plan your session! Join us in an interactive exploration of scholarly teaching. We will traverse the humanities, from medieval literature to contemporary philosophy, and will share our discoveries about the value of collaborative experiments in SoTL. This talk will lay out the insights that emerged from a year-long SoTL mentorship project, but more interestingly, perhaps, it will open up new questions about the nature and import of scholarly teaching. This is the last meeting of the SoTL journal club for Winter 2018! Please note that “interlopers” (people who aren’t presenting this term, and may have time only to read the abstract) ARE absolutely encouraged to attend! 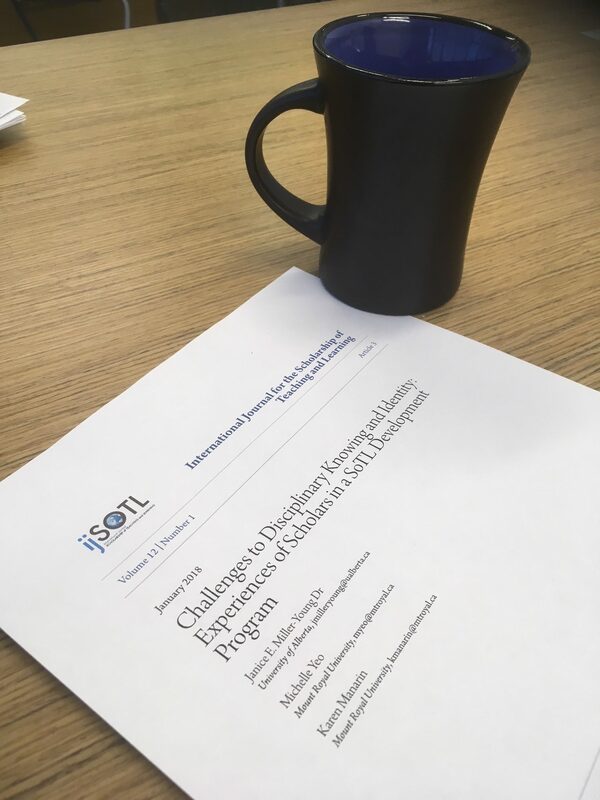 Last week we had a lively discussion in our SoTL Reading group about who gets published in SoTL journals, what kind of work meets a quality threshold of “good enough”, and where that invisible line should be drawn. The conversation turned to questions of inclusion, exclusion, and rigour in SoTL studies. We worried about perceptions of rigour by academics in other disciplines (or our perceptions of those perceptions). This makes me think about some of the unique elements of SoTL, which leads to an interesting environment in terms of publishing our work in peer-reviewed journals. While connected to educational research, SoTL thinks of itself as distinct and fairly new in disciplinary terms. Boyer’s model dividing research into four categories, including the Scholarship of Teaching and Learning was published in 1990. It is a discipline still feeling its way in some respects, and new journals continue to emerge and develop. I don’t want to overstate this, and doubtless someone will argue with me that it is not as new as all that, but in the university environment, we’re the new kid in town, which comes with certain challenges. We don’t have hundreds of years of disciplinary history to lean on, which lends a certain gravitas to disciplines that have been around since say, Plato. By definition, SoTL is undertaken by academics typically trained in other disciplines, from STEM to the humanities to the professions, and so on. Some SoTL researchers, like myself, come from the field of education, but we are in the minority. Indeed, to my surprise, I’ve had to struggle with how SoTL is distinct from my home discipline. For others, SoTL is a bigger disciplinary leap. We learn that some SoTL reviewers and journals may expect social science conventions in submissions, while others are more forgiving. If you publish within your own discipline’s educational journals, it is likely that disciplinary conventions will be applied to your writing. This can be a confusing state of affairs for new SoTL scholars. We heard in our discussion from Miriam Carey, one of the editors of The Canadian Journal for the Scholarship of Teaching and Learning, how the journal actively takes an inclusive and developmental approach to submissions. In an academic world where the currency of “rigour” and “standards” often translates to high rejection rates, the cost to a developmental approach may be concerns about lack of rigour. Gary Poole, co-editor of Teaching & Learning Inquiry, in his opening keynote to ISSOTL 2017, spoke about the importance of reviewers remaining constructive in the process. I believe that we gain more than we give up with such approaches, and it is important to recognize new SoTL scholars take considerable risk in moving into the arena. Janice Miller-Young, Karen Manarin, and I have written about the challenges to disciplinary knowledges and identity new scholars often experience here. I think this is an important discussion. I don’t have a lot of patience with the notion that SoTL is somehow a “light” discipline, but I do think we need to continue asking questions about inclusion and quality as we develop deeper disciplinary roots over time. I hope you can make it on January 8th (RSVP to jmee@mtroyal.ca), and have a great holiday! Join the SoTL Reading Group! The MRU SoTL reading group will be back for a second year. The first organizational meeting will take place on December 12th 2017 at noon in : EL 2462 (Riddell Library and Learning Centre). We will discuss the format and schedule of future discussions (to be held in 2018). Following from last year’s iteration of this initiative, these scholarly meetings are intended to bring together people interested or engaged in SoTL to talk about important contributions to the field. Some people might call this a “journal club”. Please feel free to circulate this email and invite others. Please let me know if you never want to hear about this from me again! Hello SoTL (and related) people! Perkins, K. M. (2016). Down the SoTL Rabbit Hole: Using a Phenomenological Approach to Parse the Development of Student Actors. Teaching & Learning Inquiry, 4(1), 1-10. As usual, we’ll be meeting in the Faculty Centre meeting room #1.